Discover how energized and refreshed you’ll feel from a great night’s rest! Eden combines scientifically proven ingredients including Phenyl-GABA, Magnesium Glycinate, and Melatonin to help calm you immediately, relax your muscles, and help regulate circadian rhythm. Sleep is just as important as diet and exercise for your health and well-being. Studies show that poor sleep can lead to a host of problems including weight gain, emotional issues (like depression and anxiety,) and impaired immune function. Quality sleep will give you the energy you need. It also turns back the aging clock by releasing growth hormones and melatonin; two of the body’s most important health-promoting hormones. Phenyl-GABA: the only form of GABA proven to elevate brain GABA levels. Helps reduce stressful thinking that increases insomnia. 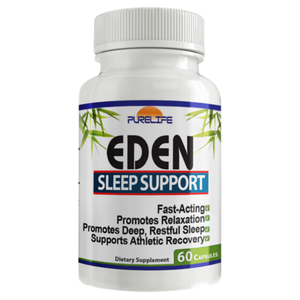 Promotes relaxation and enhances deeper, more restful sleep. Magnesium Glycinate: Unique for of highly absorbable magnesium that does not produce intestinal upset. Supports muscle relaxation, nervous system health & may reduce nighttime leg cramping. Melatonin: This hormone is not a sleep aid, but helps to regulate circadian rhythm. Has anti-cancer and anti-aging properties. Anyone exposed to blue light at night (TV or phone) has lowered melatonin levels. We add a small amount to mimic the natural amount of melatonin the body manufactures. Taurine: An amino acid that calms and relaxes by stabilizing electrical signals across cell membranes. Glycine: An amino acid that supports healthy GABA recepto function. L-Theanine: An amino acid that promotes relaxing alpha brain waves and boosts GABA levels. As a dietary supplement, adults take 1 capsules 30-60 minutes before bed, as needed. Full effects typically felt after 60 to 90 minutes. Use caution when increasing dose. Best used on a cyclic or periodic basis, and as part of an integrated sleep hygiene program. WARNING: Keep out of reach of children. Not intended for those under 18 years of age. Eden may increase sensitivity to alcohol. Do not drive or operate heavy machinery if consuming Eden with alcohol. Consult with a physician if you are pregnant, nursing, or on anxiety medication. Do not exceed 3 capsules per day.